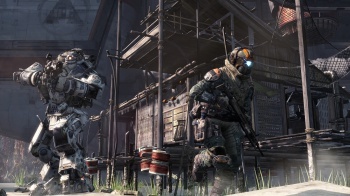 "We have not revealed those details at this time," says Titanfall. What details? Well, pretty much all of them. If you happened to notice a Beta test advert for Titanfall, the mech-based shoot-em-all due for Xbox 360, Xbox One and PC, that advert was a filthy lie. "Please note that all sites advertising Beta access are 100% scams," Titanfall Tweets, after its triumphant but exhausting PAX experience. But the Titanfall team isn't in a hurry to release any other details; each Tweet asking about features like multiplayer splitscreen were met with "we have not released those details at this time." Titanfall is Respawn's debut, and one of the most anticipated next generation titles. It popped up as a leak back in June before getting an E3 reveal. This is an Xbox One exclusive, due for release sometime in spring 2014; though there will be a 360 version, that edition will be made by a different studio. The developers are aiming for a District 9 feel with Left 4 Dead storytelling style; that, and plenty of explosions, by the look of some of those trailers. If you were looking for multiplayer action with hulking great mechs, look no further; but don't go looking for beta, at least not yet.